“The United States is belatedly trying to challenge Beijing’s ‘great wall of sand‘ in the South China Sea by sailing a warship near man-made islands that China is using to underpin its expansive territorial claims. “Designed to push back against China’s challenge to international order, the naval patrol risks a potential military confrontation in the short term. Yet it offers little prospect of dissuading Beijing from pursuing its far-reaching territorial ambitions in one of the world’s most important waterways. Note the phrase “China’s challenge to international order.” Translated into straightforward English, what this actually means is “China’s challenge to Washington’s diktat.” According to the Obama administration, China’s jurisdiction extends only to 12 nautical miles from its shores: this is in line with the 1958 UN Convention on the Territorial Sea and Contiguous Zone. However, what’s good for the rest of the world doesn’t apply to the United States, which, in 1999, declared that its jurisdiction extends outward to 24 nautical miles. Oh, the advantages of being a global hegemon! The competing claims to the South China Sea and the Spratly island chain are hopelessly mired in the mists of history, and sending a destroyer to the region isn’t going to resolve this longstanding dispute. A 1947 Rand-McNally map shows China as the owner of the now-disputed Paracel islands. But that was then – this is now. China’s claims are echoed by Taiwan, which also extends its supposed sovereignty over the entire region based on maps from the time of the Ming dynasty. 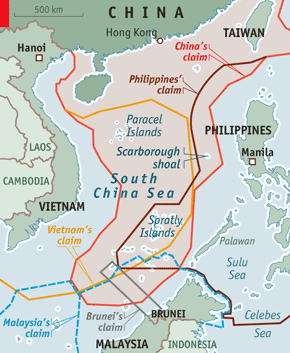 Back in 1999, when the so-called Republic of China (ROC) announced its jurisdiction over the Spratlys “legally, historically, geographically, and in reality” – based on the same historical evidence as proffered by Beijing – we didn’t hear a peep out of Washington. Now, however, the US has arisen to pose as the guarantor of the “freedom of the seas” – even though the Chinese have never interfered with commercial routes through the South China Sea, and would have no interest in doing so. Vietnam, which collided with Taiwan last year over the Spratlys, has done its own share of island-building, and has been militarizing these outposts since long before the Chinese began their efforts. Again, Washington has maintained a discreet silence. In 1958, when Vietnam and China were allied, the communist regime of North Vietnam renounced its claims in the South China sea, ceding them to their friends in Beijing. South Vietnam rejected this, however, and it looks like the Communist Party of Vietnam is going with Ngo Dinh Diem rather than Ho Chi Minh on this issue. In 1974, Vietnam occupied Sand Cay island – and we heard nothing about it from Washington. That’s because there is one standard for China, and another one for the US and its Asian sock puppets allies. All the brouhaha over the “freedom of the seas” is just a cover for Washington’s “Asian pivot,” which is aimed at containing Chinese influence in the region. As US spy planes fly over Chinese territory and the US Navy edges closer to China’s shoreline, no wonder they’re building a “wall of sand” as a defensive measure. Imagine if the Chinese navy came within 12 nautical miles of, say, the island of Manhattan – while claiming it was defending the “freedom of the seas”! It would be bombs away, no questions asked. Yet the US believes it has the “right” to traverse “international waters” within the same distance from the Chinese mainland. What in the world is the United States doing sticking its long nose into a historical-territorial dispute that doesn’t involve it or its legitimate interests? Washington’s conceit that it is the guarantor of the “freedom of the seas” is a dangerous extension of the idea of collective security – itself a pernicious concept – that amounts to nothing less than the unilateral annexation of the world’s oceans! What’s next? Will Washington re-christen the South China Sea the East Texas Sea? I wouldn’t put it past President Trump….